A little off the usual track for my blogs, but ... it is Labour Day Monday, and in the U.S. there's a group of workers inspired by the idea that a person with a full-time job should be able to escape poverty. As a wave of one-day walkouts by fast-food workers gains momentum in a push for a $15 hourly wage, the movement has been notable both for the prominence of young faces and for the audacity of their demand. ...corporate profits were again up near record highs as a share of national income while compensation fell again and is now at the lowest share it has been since the year I was born (1955 — ancient history, I know). And yet, what I mostly heard about this was about the audacity and the economic illiteracy of the strikers. The Canadian Encyclopedia communicates the relevant of Toronto, and it's newspapers in the formation of Labour Day. Pretend you are a government distributing funding for studies out of genuine curiousity. Pretend you are a government looking to purchase a predetermined outcome from a study. So much for Vermont being a low-emissions electricity system. The stated reasons for Entergy's decision seem to mirror Dominion's stated reasons for closure of Kewaunee earlier this year. Making the decision now and operating through the fourth quarter of 2014 allows time to duly and properly plan for a safe and orderly shutdown and prepare filings with the NRC regarding shutdown and decommissioning. The feasibility of small modular reactors is questionable when smaller, lower-cost, legacy reactors are not. Electricity units: The marketers equivalent of stepping down to gigawatt hours from terawatt hours is stepping down to kettles from houses. SCOTTISH Government plans to generate all of the country’s electricity from renewables have been blown off course by the summer heatwave. Wind farm electricity output drastically fell away as a high pressure system throughout June, July and August gave the country a welcome break from months of rain. The massive drop in energy production during the weeks of hot, windless weather has seen wind farm critics claim the strategy will see the “lights go out” in Scotland. In total turbines produced 1,044GWh (gigawatt hours) of electricity in June, 4.7 per cent of the total 22,335MWh input from all sources into the National Grid. In July that total dropped to just 726GWh – or 3.1 per cent, of the total. The statistics for this month lie at 667MWh, which is 5.1 per cent of the total output. During one week-long period at the height of the heatwave, one wind farm – Bilbster, near Wick – was generating enough to boil little more than 180 kettles, instead of the intended equivalent of 1,300. A couple of perspectives on the large increases occurring in what the system operator refers to as the "commodity charge" - consisting of HOEP (Hourly Ontario Energy Price) and the Global Adjustment Class B rate. As I worked with Parker I was snared by the realization that aspects of Ontario's electricity contracting meant prices would fall only if emissions rise - and vice-versa. I attempt to communicate the absurdity of the situation on my original content site in The Capacity Trap: Ontario's Electricity Costs Soar as Emissions Drop. The Ontario Energy Board (OEB) is responsible for setting Ontario's time-of use (TOU) and regulated price plan (RPP) electricity rates, and it does this twice annually, in April and October. The announcements are made slightly in advance of the effective dates of May 1st and November 1st and reflect what the OEB anticipates will occur in the upcoming six months. The reset rates are based on what the OEB feels will be required to pay the generators over that period of time. The OEB preface their announcement by saying that “the increase will add [insert amount] to the average ratepayer’s bill per month or [insert percentage] of the total monthly bill.” They never specify that it is only the cost of electricity and that other items on your bill will/or may have already gone up! Their last announcement on TOU and RPP rates indicated an increase of 2.9% for the May 1, 2013 bills but it was actually an annual increase of 11% for many residential consumers. The upcoming announcement in late October will accordingly reflect an adjustment to what has actually occurred (during the six months from May 1st to October 31st) and what is anticipated in the next six months. Based on the first three months (May through July 2013) of the current period, Ontario's ratepayers should expect another significant increase. Data from the Independent Electricity System Operator (IESO) indicates this period has seen a drop in Ontario's demand of 4.7% or 1.7 terawatts (TWh) which is equal to 1.7 billion kilowatts (kWh). In any sane industry, a drop in demand normally signals the providers that the product/service needs a price reduction, or suppliers to exit the market, but the electricity sector is not ruled by “sane” individuals. It is a instead a centrally mismanaged industry run by the McGuinty/Wynne Liberal government with support from the NDP. Do wind turbine costs need to come down? “If you want to do wind on a big scale with power plants based on wind, you need to go offshore,” said Michael Hannibal, chief of Siemens’s offshore wind business. “Power plants” are the important words here. Wind farms are no longer engineering experiments or small pilot schemes. They have grown very large, to the point where they are of the same scale as gas- or coal-fired power stations. Mr. Hannibal said that costs are coming down at the rate of 40 percent per decade, but he concedes that the industry still has much to do to become competitive. The high costs mean that there is little incentive to build these plants without hefty subsidies. "Ourselves" are not the target of Hannibal's fooling. "Whether the wolf is on the porch or in the room, it's damn close to where we're sitting"
In addition to 6.5 GW of known retirements -- many of which were initiated by new federal environmental rules -- another 4.5 GW of generation is mothballed and expected to be retired for environmental or economic reasons. As generators representing another 200 MW have not responded to the survey, those are also assumed to be retired, Moeller said. "I'm not prepared to cry wolf, but the conditions are such that there may be a wolf at the door," Moeller said. "There's a full moon, there's howling, and indications are that there may in fact be a wolf." A male speaker who was not identified to conference call listeners added: "Whether the wolf is on the porch or in the room, it's damn close to where we're sitting, regardless of where the wall is." MISO expects about 2,400 MW of new build generation to be brought online across its footprint by the summer of 2016. Assuming no load growth, MISO could be short 3,000 MW of generation needed to meet its minimum 14.2% planning reserve margin by 2016, Moeller said. Assuming 0.8% load growth, the potential shortage could be as much as 5,000 MW, and assuming 1.4% growth, the shortage could be 7,000 MW, he said. "We have not operated at those [levels of] minimum requirements since the late 1960s," Moeller said. Increasing potential supply, by ensuring that there is sufficient “spare” capacity that is able to generate during periods of high demand when additional electricity is required. In terms of the Capacity Market, we are talking not of traditional plant margin but instead about generating capacity which is only called upon in times of potential generating shortfall. Reducing demand, whether this means electricity users agreeing to limit their electricity use in periods of high demand (Demand Side Response (DSR)), or through incentivising permanent electricity demand reduction. A couple of stories that caught my attention this week. 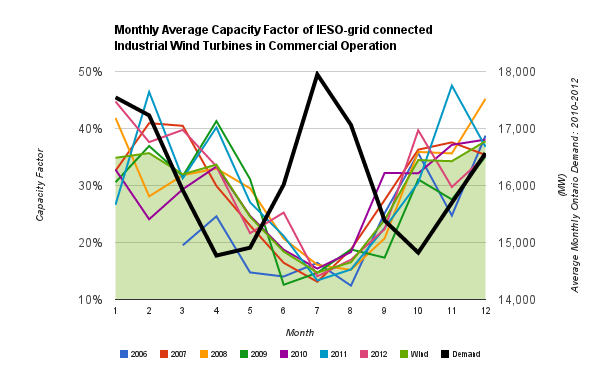 The global wind industry was repeating claims from IBM (International Business Machines Corp.). IBM has officially launched a new weather modelling system specifically designed to help renewable energy generators and utilities accurately predict output from wind and solar farms, allowing them to reduce back-up power requirements and increase output from renewable energy plants. The so-called 'Hybrid Renewable Energy Forecasting' (HyRef) system combines advanced weather modelling with detailed information on windturbine and solar panel output to allow utilities to model output in near real time. The mainstream media has lots of stories about the great blackout of a decade ago - here's a speech from Bob Rae's second appointed head of Ontario Hydro from 1993. As Ontario dabbles in long-term system planning once again, it's worthwhile to consider the scarcity of supply during peak demand periods in 2003 wasn't necessarily due to decisions in only a couple of years preceding 2003. In light of our current surplus capacity, which we project will continue for the next 10 years, Ontario Hydro cannot commit to developing new capacity, to extending existing capacity by retubing the Bruce A reactors, or purchasing new supplies from non-utility generators at a time when we don't need the power. To do so would result in unnecessary rate increases at a time when our customers can least afford them. "At least offshore wind cannot be blamed for the rise." GERMANY: Germany's renewables levy looks set to rise following a fall in wholesale electricity prices to EUR 33/MWh, a historically low level. Electricity prices are unlikely to rise while lignite and coal generation benefit from negligibly low CO2 emissions allowance prices. 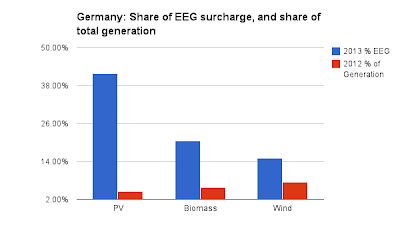 The consequence is likely to be another hike in Germany's renewables levy in 2014 of up to 30%. 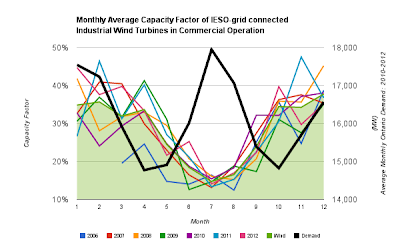 The wind industry could also argue it isn't due to onshore wind - which did add capacity but has seen lower production over the first 7 months of 2013 anyway. It appears that this consultation effort is aimed more at legitimizing policy decisions the government has already made than soliciting and implementing input from the voters. I was delighted to see references to my work in a Press release today from Lake Superior Action Research Conservation (LSARC), informing citizens about the review of Ontario's Long-Term Energy Plan prior to Tuesday's "public open house" in Sudbury. On Tuesday August 13th, 2013, The Ministry of Energy will be hosting a public session/open house in Sudbury at the Quality Inn & Conference Centre Downtown, 390 Elgin Street South, between 7pm and 9pm. This public session/open house is one of 8 being held around the Province as part of the Ministry's 2013 Long Term Energy Plan (LTEP) review. The Ministry and OPA are also consulting behind closed doors, by invitation only, with 'Industry Stakeholders' earlier in the day. To the best of our knowledge no one from the public or media has been invited to any of these closed sessions. 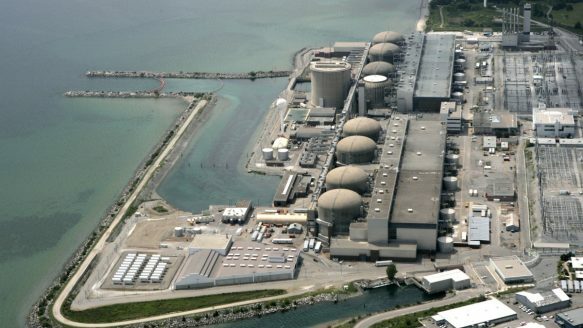 The 40-year-old Pickering nuclear power plant will continue supplying power for another five years without a major refit – providing it meets several conditions. But just two miles from the White House stands the Capitol Power Plant, the largest single source of carbon emissions in the nation’s capital and a concrete example of the government’s inability to green its own turf. By then the plant had reduced the amount of coal in its fuel mix to 5 percent, down from 56 percent in 2007. But it made up the difference primarily with diesel fuel oil because, as the architect of the Capitol, Stephen T. Ayers, told a Congressional panel in 2008, converting the plant to burn natural gas exclusively would have required a modernization costing $6 million to $7 million. Germany has ~30GW of wind capacity, so if wind produced as little as stated in this article, that's a shockingly, shockingly low monthly capacity factor of 1.25% - which indicates a toy technology entirely lacking in capacity value. The latest marketing results for renewable energy have also led to the account balancing the sales revenue and expenses dipping further into the reds. The monthly EEG balance account started in January with a surplus of EUR 420,629,619.12. Since May 2013 the balance account is negative, with a new peak of EUR – 848,943,247.03 for July. Furthermore, as last year’s EEG surcharge did not cover all expenses, the account started into the year with a minus of EUR 2,691,166,648.46. Hence the current balance account in total is EUR – 1,748.488,953,69. Compared with the deficit in July 2012 (EUR – 1,145,542,614.71), this does not bode well for the EEG surcharge for 2014, which will be announced in October 2014 by the TSOs. Out of the 6,973 GWh in July, PV contributed 4,817 GWh, with biomass being a distant second at 1,575 GWh. Wind contributed 276 GWh, the lowest so far this year. A central estimate in the range of possibilities presented in the administration's new calculations is that each additional ton of carbon dioxide emitted in the year 2020 will cost society $43—a number that rises in subsequent years, as the mounting pollution exacerbates the problem of global warming. That estimate is about 66 percent higher than the $26 per ton cost calculated back in 2010, when the administration issued its first set of estimates." The new price tag attempts to measure today, in dollars, the harm that will happen years, decades or even centuries in the future, as the globe heats, the seas rise, and the bill for each additional year of pollution comes due. The estimates, completed in May, were calculated by a specialized inter-agency task force and are based on the latest, peer-reviewed scientific research. The task force relied on a set of three models developed over the years by scientists and economists trying to better understand the consequences of greenhouse gas emissions. Integrated Gasification Combined Cycle (IGCC) coal-fired power plants are a rarity, and implementing the tachnology at utility scale plants promising flexible fueling and a path to carbon capture and storage (CCS) is proving an expensive task. As are most First of a Kind (FOAK) builds. The potential that such costs will come at the expense of ratepayers is a big concern, said David Agnew, an attorney for Citizens Action Coalition and the Sierra Club. He said it’s important to keep the cost of the Edwardsport plant in perspective: it’s five times more expensive than a $631 million natural gas plant that Indianapolis Power & Light has proposed, and the IPL plant will produce more power. Duke, the nation’s largest electricity utility operator, has defended the plant, touting its environmental advantages and economic benefits for Indiana’s coal mining industry. It will generate more than 10 times the amount of electricity as Duke’s previous coal-powered plant in Edwardsport, but with 70 percent less emissions, Stultz said during the media tour in June. But that’s only true if it works. The project — one of the most expensive in Indiana history — has been mired in controversy for years. An important news item for readers outside of Ontario: Ernst & Young have performed a cost-benefit analysis for the German government which concludes consumers would be needlessly punished by meeting a European Union quota on smart meter installations. For readers inside Ontario, simply another reminder of the stupidity of McGuinty's immature roll-out of both smart meters and solar procurement policies, whereby Grandma has a meter for her low usage hovel but nobody can tell you how much contracted supply is being produced, when it is being produced, or at what cost to end consumers. The German Federal Ministry of Economics (BMWi) has published a study analyzing the costs and benefits of a full roll-out of smart meters in Germany. It concludes that it is not advisable and not in the interest of German consumers to implement the EU targets which would require that at least 80 % of consumers shall be equipped with intelligent meter­ing systems by 2020. 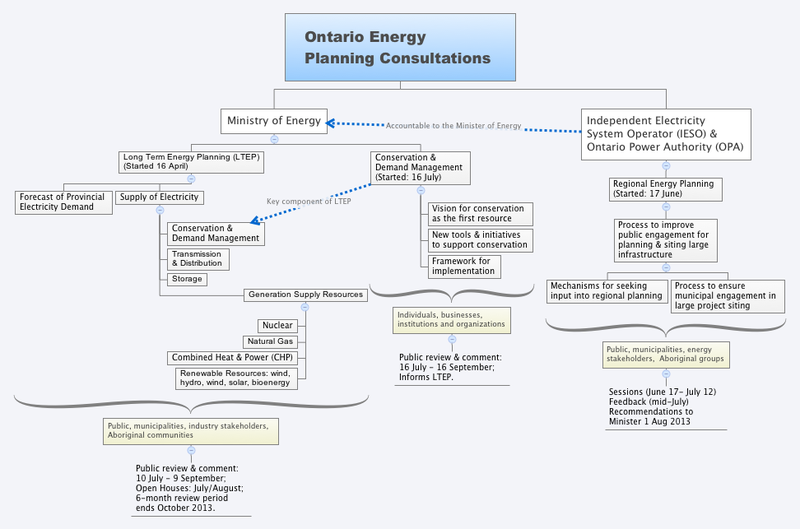 An informative blog post for those following Ontario's electricity exercises, although what the writer calls "action towards increased transparency" I strongly suggest may be actions towards having the appearance of consultation - without the substance. The summer-long timeframe combined with the lack of forums to debate key issues falls short of the ten principles for gaining public support of long term energy planning recommended by MowatEnergy in their recently published report. And, if the intention is to provide “meaningful and substantive” consultation that will help direct Ontario’s energy future, then this brief period of public review and comment will result in nothing more than cursory and superficial feedback that fulfill objectives of process and expediency. If you are interested in the power industry, this is pretty well a "must read"
Panelists at the ELECTRIC POWER 2013 Keynote and Roundtable Discussion in Chicago in May were consumed by the need to ensure future reliability by more closely integrating the gas and electricity markets. Acknowledged less directly were distortions created by renewable energy subsidies and mandates, onerous regulations affecting coal, and “irreversible” demand destruction caused by the success of energy efficiency and demand management programs. The elephant in the room was the continued demise of electricity markets....Unlike past years, no one questioned the shale gas resource estimates (Figure 1), just the ability to get it to a power plant when needed. If the writing on the wall about the impact of the domestic shale gas bonanza was visible to these industry leaders before, in this session it glowed in neon against the darkened sky of high winds, a fading spark spread, little if any dark spread to support new coal, and continuing threats to a critical zero-carbon option, nuclear power. ...The “market” doesn’t value capacity, was one refrain, and certainly not baseload capacity. Another critical observation was that a just-in time (JIT) natural gas delivery system is clashing with the JIT electricity delivery system. Overlay onto that clash “must take” highly intermittent wind- and solar-generated electricity, plus demand destruction through energy efficiency, plus demand side programs. Some support for my skepticism of conservation claims, and from the the excellent Energy Economics Exchange site of the Energy Institute at Haas (University of California at Berkeley Haas School of Business). The Wall Street Journal, Forbes, and, most recently, the Sacramento Bee have pieces on Arik Levinson’s new NBER working paper, “California Energy Efficiency: Lessons for the Rest of the World, or Not?” The paper makes a nice point, but I worry that it is being misinterpreted. While some have attributed the difference to California’s energy-efficiency policies, Levinson argues that California’s temperate climate, changing demographics, and other factors can explain almost 90% of the gap. For example, Levinson shows that part of the explanation for the increase in other U.S. states is that more and more people are living in the Southwest, where air-conditioning is used more intensively. In the darkest days of World War II, Canada and a small cohort of nations quietly entered the Nuclear Age. The Allies’ main concern at the time was racing Hitler to the Bomb, but the science – only uncovered in 1939 – promised so much more: unprecedented medicines and disease-fighting techniques, stronger and cheaper materials, seemingly boundless energy. Nuclear fission was fast becoming a revolutionary discovery of humankind, and by war’s end, Canada had the jump on the rest of the world in exploring its non-military potential. This happened at Chalk River Laboratories, about two hours west of Ottawa, in the middle of what many Canadians would have considered “nowhere”. Here the National Research Council built (and later turned over to a new crown corporation, Atomic Energy of Canada Limited) the world’s best-equipped nuclear laboratory in its day, sparking a journey of discovery that led to cancer therapy, nuclear medicine, a long list of scientific firsts, and a made-in-Canada nuclear power reactor that today leads the industry for fuel efficiency and safety. The CANMOX solution would involve Candu Energy building four Generation III Enhanced CANDU 6® (EC6®) reactors to reuse the UK's existing plutonium stockpile as fuel to produce up to 2800MWe of low carbon power for sale to UK consumers. The 60 year design life EC6 reactor has successfully completed its formal regulatory design review by the Canadian Nuclear Safety Commission (CNSC). "Candu Energy's aim in the UK is to develop an integrated solution to safely, securely and efficiently dispose of the country's civil plutonium stockpile," said Dr. Alizadeh, "which would result in the construction of safe, reliable and economic EC6 reactors and provide high value UK content, and long-term UK jobs in construction, supply chain and operation for both the fuel plant and reactors." The entire press release can be read at CANDU Energy Inc.